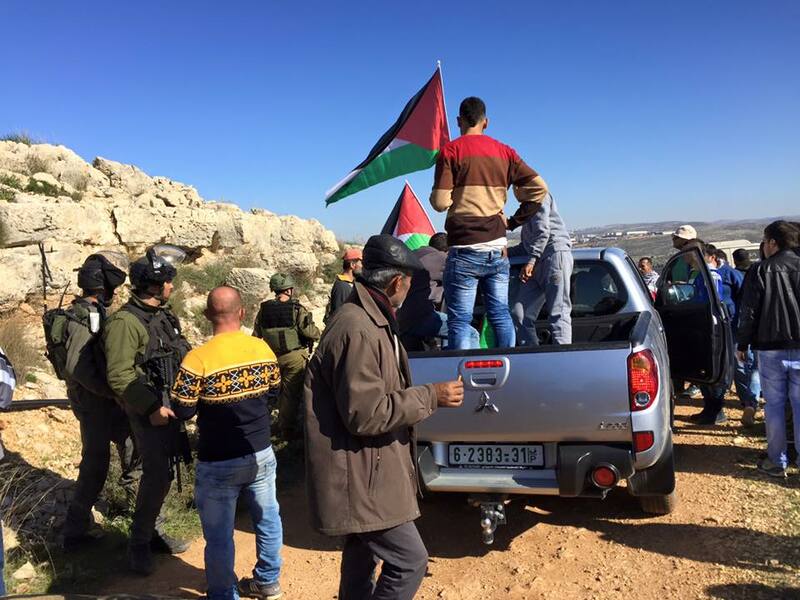 A peaceful demonstration and prayer took place yesterday, Friday 4 December ’15, on a hilltop between the Salfit’s villages Kafr ad-Dik, Bruqin, Sarta and Biddya. These villages are surrounded by the illegal Israeli settlements and industrial areas. As IWPS readers will know, in the Salfit region of West Bank illegal settlements outnumber Palestinian villages. There are 19 Palestinian villages, which have been there for many centuries and 24 settlements and three industrial areas built in recent years on stolen Palestinian land and colonised by the illegal Israeli settlers. More on this can be found on IWPS website iwps.info under ‘Villages’. As demonstrators arrived , they were met by the Israeli military, which tried to prevent them from reaching their hilltop destination. 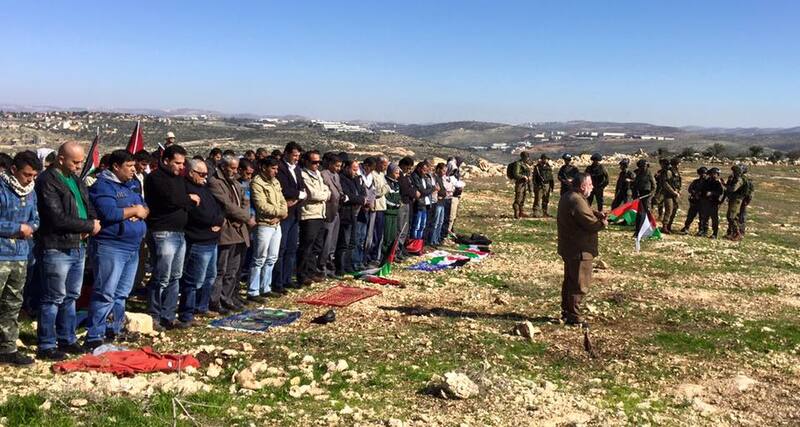 It took villagers, accompanied by their solidarity supporters, about an hour to negotiate with the soldiers a ‘permission’ to access their own land where they wanted to pray. More than two years ago, the Israeli occupiers bulldozed and flattened over 1000 dunum (one dunum is 1000 square meters) of land in the hilltop location where the protest took place. At that time, villagers and international activist, including IWPS, organised a protest and further construction works were stopped by the court decision. This October, the building work was restarted and residents from the neighbouring four Palestinian villages became very concerned about what was going to happen to their land. It is a usual practice of the Israeli occupiers to usurp the Palestinian land and with the protection of the military carry out works without even informing the rightful owners of the land.No exception was made in this case. 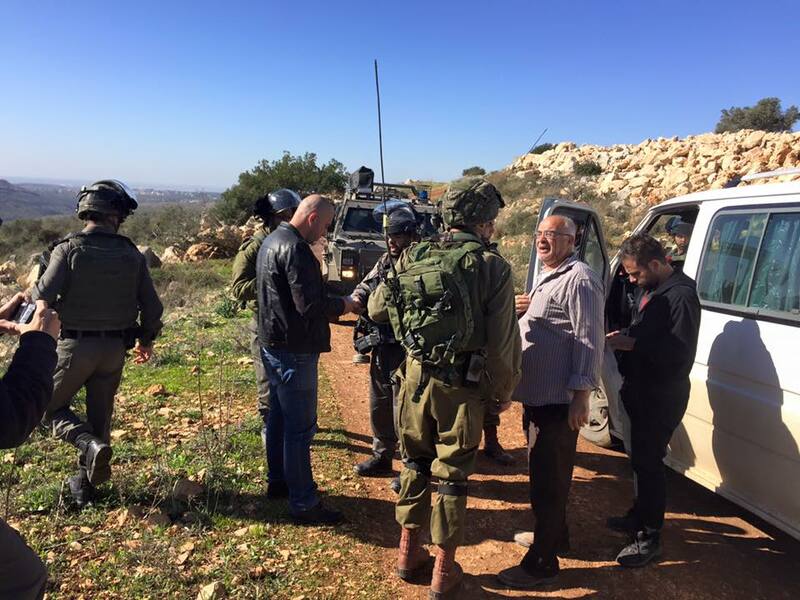 The hill where the protest took place, is very important for the Salfit district and for the whole of the Palestine. This is the only hilltop in the area not taken over by the settlement buildings. If the Israeli occupiers go ahead with the settlement building on this location , this will create a strip of uninterrupted Jewish settlements going form Tel Aviv to the Salfit’s largest illegal Ariel settlement in the east. This would bury any hope for creation of the viable and contiguous Palestinian state as the West Bank would be cut in four unconnected Palestinian areas: Jerusalem, lands south of Jerusalem and with the lands north of Ramallah being separated in two by the settlement block going through the middle of Salfit region connecting Tel Aviv with the illegal farming settlement in Jordan Valley. When the demonstration and the prayer finished, people went back peacefully to their cars and to find out that soldiers took the keys from the cars so we couldn’t go back . It took ‘only’ 5-10 minutes to negotiate to have them back so that we could leave as the army wanted us to do. Life in Palestine is both very complicated and full of injustices.